Just after midnight in September, a pickup truck struck and killed a 55-year-old woman crossing an intersection in a motorized wheelchair on a dark stretch of Kansas City, Missouri, highway. The streetlights had gone out there — after thieves stole their copper wiring. The unusual crime has been on the rise in some states, transportation officials say. Besides creating dangerous conditions, the copper wire thefts have become a drain on state resources. 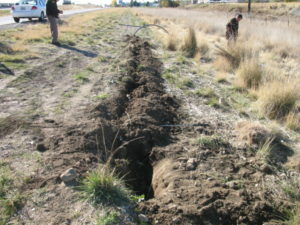 In Washington state, some Department of Transportation regional offices likewise reported a spike in copper wire theft. Officials are especially concerned because some thieves have cut the safety wires that ground electrical current. This leaves state workers exposed to a risk of electrocution when making repairs or doing maintenance. In Oklahoma, state officials estimate they’ll need $500,000 to repair the lights on Interstate 40 in downtown Oklahoma City that have been hit by copper thieves. The Department of Transportation had fixed those lights in 2014 and 2015 for about $300,000, said spokeswoman Brenda Perry, but thieves struck again. Copper wiring typically is found in boxes at the base of light poles or on highway barriers, and in controller stations — above-ground cabinets off the roadway connected to a whole section of lights. Some thieves dress in phony gear, such as reflective vests, posing as utility or transportation workers. Others just walk right up, break into the boxes and steal the wires outright. The crooks, some of whom police say are drug addicts looking for quick cash, take their loot to scrap recycling yards to sell it. Stealing copper can be lucrative. Scrap copper currently goes for more than $2 a pound. And while copper theft ebbs and flows, often depending on the economy and the metal’s price, it never goes away. While that’s a drop from the 39,993 claims filed for the previous three years, it’s still a problem, said Frank Scafidi, the group’s public affairs director. For transportation officials, it’s more than just dollars. Roadway lighting can reduce night-time crashes by about 35 percent, according to a Federal Highway Administration study. In the Kansas City death, police said the traffic signals were working, the woman was crossing at a red traffic light and the driver had a green signal. There was some light from the traffic signals, said the state transportation department’s Barry, so the incident can’t totally be blamed on copper wire theft. “But it brought more attention to the problem, and that’s important,” she said. And it isn’t just dangerous for motorists and pedestrians. In June, a man died in Oklahoma City after being electrocuted while apparently trying to steal copper wire from a box connected to a light pole on a city street. State legislatures have been trying to tackle the metal theft problem for at least a decade. Every state now has laws aimed at curbing the practice, according to the Council of State Governments. Some require scrap metal recycling yards to check the identification of anyone who sells them metal. Some make dealers provide better documentation, such as noting the license plate of the vehicle that transported the metal. Some have hiked penalties for stealing metal. But the thieves are still out there. State transportation officials have been fighting back by installing what they hope is tamper-proof equipment. In Missouri, where the problem is particularly bad on U.S. Highway 71, which connects the south suburbs to downtown Kansas City, the state transportation department put theft-deterrent doors on light pole bases that need special tools to open them, Barry said. But ultimately, it didn’t keep the thieves away. Right now, Barry said, large portions of one 12-mile stretch and another 5-mile stretch of U.S. Highway 71 have no lights. The transportation department’s electricians are trying to come up with their own solutions, and officials also are considering putting copper overhead on the top of light poles rather than underground. But that could lead to other issues, Barry said, such as exposure to bad weather and the unsightly aesthetics of cables overhead. In Washington state, which has spent nearly $250,000 in repair and replacement costs since July 2017, workers have welded junction box covers and replaced copper with aluminum wire in some areas because it’s cheaper and less appealing to thieves, said transportation department spokeswoman Barbara LaBoe. But now in some cases, she said, thieves are breaking into cabinets that control all the connections instead of just junction boxes. In May, the Yavapai County Sheriff’s Office in Arizona arrested three people for allegedly scrapping more than 300 pounds of copper wire stolen from state rights of way. A search of one suspect’s home found glass methamphetamine pipes, a digital scale and meth residue on top of a dresser. In northwest Indiana, the state Department of Transportation teamed up with the state police, which has stepped up patrols around highway lighting. Technicians at the transportation department’s traffic management center also monitor highway cameras 24 hours a day, looking for potential copper thieves. In March, police arrested two people on charges of stealing copper wire from a state highway in Gary. And it isn’t just states that are footing the bill when thieves rip off copper wire from roadways. Last month, a thief in Billings, Montana, stripped about 5 miles of copper wiring from city streetlights. Four high-traffic areas of the city were left in the dark. As of last week, there had been no arrests.